Display your flatscreen TV, media players, and your decor of choice with this 54" TV stand. The rustic design with a simple silhouette and the detail of distressed, knotty alder veneers makes a perfect complement to an urban rustic, lodge, or mission style room. Offers open storage for media players, fully equipped with wire management openings for wrangling all those wayward cords. Two doors offer additional closed storage. The Greyson Rustic 54" TV Cart with Two Doors by Legends Furniture at Reeds Furniture in the Los Angeles, Thousand Oaks, Simi Valley, Agoura Hills, Woodland Hills, California area. Product availability may vary. Contact us for the most current availability on this product. 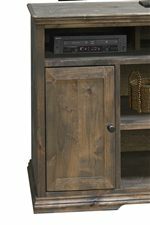 Ensure that your living room or bedroom is a step ahead of the pack with these distressed, rustic TV stands. Each media chest shows off a a casual and fashion-forward style of distressed knotty alder veneers adding visual interest and rustic appeal to these American-made chests. The Greyson group all feature media storage for TVs and media players, as well as built-in wire management exits. One console comes standard with electric fireplace insert panel, creating the perfect living room centerpiece to gather around. The Greyson collection is a great option if you are looking for Contemporary Mission furniture in the Los Angeles, Thousand Oaks, Simi Valley, Agoura Hills, Woodland Hills, California area. Browse other items in the Greyson collection from Reeds Furniture in the Los Angeles, Thousand Oaks, Simi Valley, Agoura Hills, Woodland Hills, California area.